Welcome to InboundBuzz, in this episode we interview HubSpot CMO, Kipp Bodnar. Kipp Bodnar is to Inbound Marketing what Michael Jordan is to Basketball – an inbound legend who knows how to win at Marketing. 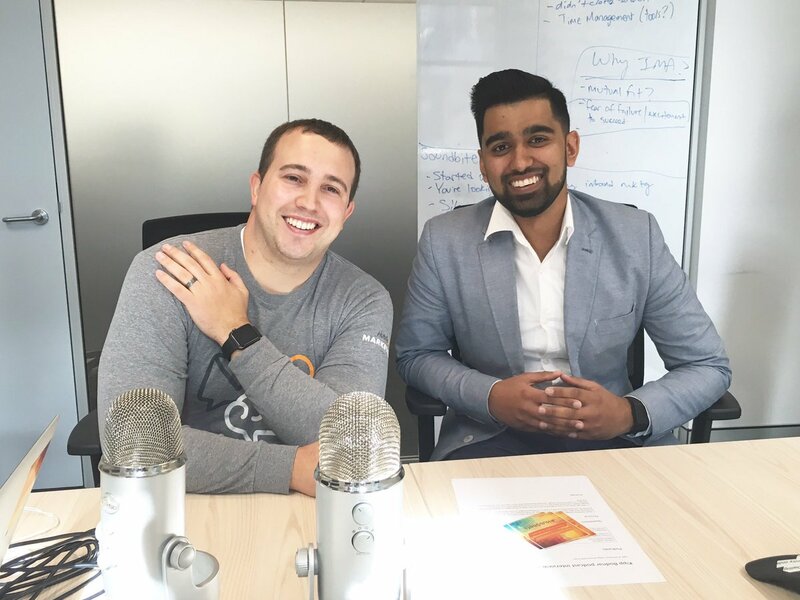 With our friends at the Hubshots podcast, we riff on achieving Work / Life balance, staying on top of Digital Marketing, Snapchat, Marketing Attribution, Adblocking, the future of voice search and a whole lot more. Kipp: Delighted to be here. Craig: All right, so the first question we wanted to ask you, Kipp, is around career paths. So, most marketing managers are very busy. They have long days, long hours. Personal life often gets squeezed. So as a CMO of a large growing company, how do you balance work and personal life? And what advice would you give to marketing managers who are considering their career growth? Kipp: Yeah, it’s a good question. So I have and eight-month-old son so I don’t have much choice but to absolutely have to find balance because I love him. And I wanna see him and spend great time with him. You know, I think it depends on your personality, the best way to do that. I’m somebody who is fairly good at compartmentalizing. So when I’m at work, I’m at work. And when I come home, when I’m with my son, you know, the phone goes away, the computer goes away. And I try to be really locked in and basically make the most efficient use of your time. And a lot of work/life balance comes down to actual time management, and people just spending time on stuff that is… Doesn’t meet the bear… the bar of importance. Like they’re just spending extra time on stuff because they think they need to versus that it’s actually important. You have to have the ability to say no to have a good balance in life. And so, there’s some things that I just won’t weigh in on or I will just say no to because I’m trying to stay very focused on what’s important to my team and to HubSpot. And so that’s kind of how I’ve approached it. And that’s my advice to everybody is think about what makes up your life and makes up your time. And figure out where you can maybe push back a little bit to get a little bit more balance into it but it’s hard. Moby: Hey Kipp, I often get asked as I’m sure Craig and Ian do, how do I stay on top of digital? Who are the thought leaders I should be following? I’m curious to know who is Kipp Bodnar following and why? Kipp: Yeah, sure. So I’ll answer the first part of that question. So like how you stay on top of marketing trends, my advice to you is you kind of need a system. Like you need a way to quickly and easily capture a lot of knowledge and information. I read stuff all day, every day but I have my system. I have like a very specific list of email newsletters that I subscribe to. I have a very curated… I use Flipboard, you could use Pocket, whatever type of online reader you’re using, where I have curated all of the feeds and all of the streams to basically give me the best knowledge there. I also read a lot of stuff on our inbound.org community where there’s a lot of discussions and you can often really valuable commentary around something that’s happening. So I really do those three things. So, when you think about specifically who to follow in the marketplace, you know, I read a lot of folks in the technology industry and in the venture capital industry like David Skok and Tomasz Tunguz and some of those folks. But on the marketing side specifically, I think there’re a whole host of amazing folks from Seth Godin, to David Meerman Scott, to all the content we create at HubSpot. But what’s great is that there’s great content and leadership no matter where you are in the world or in the region. Like in Australia, I’ve met tons of awesome marketing experts since I’ve been here. And just even connecting with those folks on Twitter and connecting with all of you is a great way to actually do that and pull that off. The other thing is to make sure you have a diversity of the continent you consume. Because sometimes when like sitting down and reading a book, even though there’s the depth to it, it allows you to think and process things in kind of a deeper way. As if you’re always just always reading quick-hit articles online, versus a book, versus white papers, versus videos. So you’re going to absorb information differently. So kind of have a variety in the content you’re thinking about. Ian: How much time do you spend Kipp going and reading all of this content and educating yourself? Kipp: I probably spend an hour to 90 minutes a day but like I’m a dork. You know when Facebook had F8, I read all through the new Facebook Live API. If you added documentation… like I think a marketer’s job is to know what’s possible. Right? Because once you know what’s possible technically, once you know what’s possible strategically, you can then like really start figuring out what you can do and how you can differentiate you and your company in the marketplace. And so for me, learning is just about figuring out what’s possible and what I can maybe do that somebody else isn’t doing yet because maybe they haven’t taken the time to learn about this stuff yet. Ian: That’s fantastic. Now, this leads really well on. So marketing managers often get conflicting advice about how many channels to use. On one hand, there is the focus on these three key channels and on the other hand though, you should be testing across all channels and re-purposing content. What do you think is the balance here with that advice? Kipp: Yeah. Just focus on your goals. Like what are you trying to achieve? There are a lot of people that I know that are in business situations and certain scales where like they can just run a blog and do a little bit of email marketing, and crush their numbers. And so think about the problem and understand what’s the kind of scale, what’s the kind of growth that I’m looking to achieve based on other people that I talk to, benchmarks in the industry. What can I expect from various channels for my business? And then basically, okay, it seems like I need to do these 3 or maybe I need to do these 10, right? And from there, then you focus on those and work and iterate and improving on those. But there’s nothing that says you have to do anything. It’s what is your business need, what is the problem that is at hand and just focus on that. Moby: Awesome. Kipp you’ve famously and successfully said in the past, context marketing respects the habits, goals, and devices of the people. Can you explain why this is important and how it ties into the practices of inbound marketing? Kipp: Yeah. When you think about inbound marketing, it’s an approach that is centered around who you’re talking to, your audience, what they need, and driving real value for them. And one of the ways you drive value for people is respect them and understand how they want to receive things. We like to think of it as, “Don’t make your prospect do crap work.” Right. Like don’t make them take an extra step. Don’t make them give you information that you’re not gonna use. Don’t make them do all of those things. Once you can remove those, not only have you reduced friction and you’re gonna achieve better marketing results, but you’ve actually created a much better experience for that prospect. They’re going to have a much better sentiment towards your company and your brand. And so, that’s really how I think about it. The bottom line is when we have meetings it’s like, “Hey, we wanna do this, but this is really for us. This is not for the prospect. This is gonna make the prospect do crap work. We can’t do it, guys.” Like we talk about that all the time. Craig: So Kipp, we wanted to ask about marketing attribution. Is this a practice that marketing directors and CMOs should be pushing more in the organization, in your opinion? Kipp: So, you know, marketing attribution and attribution models, it’s a really complex topic. You’ve got first action attribution, you’ve got multi-touch attribution, you’ve got last action attribution. There’s a bunch of different attribution models that exist. We could do a podcast for our entire lives around attribution models if we wanted to. I think what’s most important actually, and sadly it fails to happen often, is that you pick one model and you understand the pros and cons of that model. You communicate that model to your team and to your company. And so, even though that model may have some weaknesses, you are all aware of that. And you are all, what we would call “playing from the same sheet of music,” right? You’re singing the same song, you know what’s going on, and you’re measuring apples to apples in everything you do. And then as you go through in your report if you’re using first action attribution, there’s some weaknesses that come with that, and there’s some challenges that come with that. And you need to kind of double click and double check data sometimes to make sure. But for the most part, that’s what’s important is actually just making a decision, not trying to do all of them. Or have one team using one type and another team using another type. Just be clear and consistent across the board. Craig: So, as your marketing career takes off, you naturally focus on more strategic areas and less on tactical. As a CMO, we’re interested in how much, if any, tactical involvement you still take part in. And especially given your expertise and passion for social in the past, and your background? Kipp: I’m a marketing nerd so I’m still heavily involved. You could make the judgment if that’s a good thing or a bad thing, I don’t know. But I’m heavily involved at probably…it’s been like five or six tactical related Slack messages or emails in the past like 12 hours. So I’m heavily involved from across the board in how we’re thinking about conversion rate optimization, to blog content, to search content strategy, whatever that may be. Like I don’t know. It’s my passion in life. It’s what I think is interesting. So, whether my team likes it or not is a question you’d have to ask them. But I try to make sure that we’re focused on the right areas, especially tactically. And that we’re solving for the right things, and that we’re drawing inspiration tactically from other people who are doing interesting and potentially really cool stuff. So, yeah, I think I probably am a little bit more tactical than your average CMO. But in my mind, that’s a good thing. I think it’s for everybody who’s listening to determine what the right balance is that works best for their company. Moby: Okay. Kipp, it seems there’s always some sort of shiny object distracting marketers from strategy. Moby: Case in point, a very popular one at the moment, Snapchat and marketing. They’re trying to figure out how to make it work. There’s something that’s distracting them. What’s your advice for markets to avoid that distraction and focus on strategy on whether it’s the right fit for that strategy? Kipp: You know, there’s some companies where Snapchat is an awesome fit. It’s a really rapidly growing platform. They and Facebook are doing the best jobs in terms of rolling out new features and innovating the platform. They’re doing a really, really amazing job and I think we should all, as just students of communication and marketing, appreciate that and take notice of that. But I think if you’re a marketer and you’re just trying to prioritize, it comes back to like the idea of kind of first principal thinking. Like what is the problem at hand, what is the problem with my marketing following? If you have an awareness problem and you’re trying to get people to learn more about you then Snapchat might be a valid platform, right? But, at the same time, if you’ve got a sales enablement challenge, or a lead to MQL conversion rate challenges, there’s a whole host of middle to the bottom funnel challenges. Then as awesome as Snapchat may be, it’s not what you need to focus on right this minute. Right? You need to solve the most urgent problem at hand. And anytime you’re working with the sales and marketing funnel, you get more leverage when you solve from the bottom up. Right? When you fix the leaks at the bottom and you work your way up to the top. And so, it’s really easy to be distracted sometimes too because that stuff’s hard. Like getting more leads to become MQLs is hard. Sometimes you’re just like, “Oh, I wanna go and do the Snapchat thing”, because even though it’s hard, it’s hard in a different way and maybe a more interesting way to some people. Right? And distracts me from the stress of that current problem. And I think that’s what, you know, I’ve done personally in the past and I think you find it happens sometimes. Kipp: Lots of ad blocking. Like 50% of Australia’s gonna be on ad block listing, dude. Moby: Kipp, you know, I think it’s because… The reason why it’s high is I think people have figured out how to do it. Kipp: There’s still a little bit of technical friction in doing it, absolutely. But, I don’t know, keep going. Moby: And I’ve kind of learned more and more people are looking to native media and native marketing. And a great example of that is influence on marketing. Moby: And now more recently, micro-influencer marketing. And it’s an area that’s grown so fast, marketers are struggling to figure out what to do in it as well. So what are your thoughts on influencer marketing and micro influencer marketing? And, do you have any suggestions for markets looking to employ those? Kipp: Yeah, there’s a couple things. Your marketing is always better when you have fewer dependencies. So it’s always better if you can be the influencer instead of having to work through some other influencer. If you can build a great content strategy, you can build a great blog content on your site, become an influencer yourself, your marketing is going to better. It’s going to be more efficient but all that stuff takes time. So in the meantime, you might have to work with and leverage other influential folks within the industry within the market. And when you’re thinking about doing that, most people approach this as like a bad sales rep would approach a problem. Which is like, “Hey Mr. or Ms. Influencer, I need you to do this thing for me,” which is not helpful to anybody. It’ more instead of… I’ve got some value to this influencer because I run an event and this person wants to speak in my event or some other…you know, one of another hundred things. Right? And so how can we develop a true partnership where we can align our brands, we can align our audiences to work together to some common goals that help the both of us. And I think sadly, people are really good at identifying influencers. They’re really good at thinking what they want the influencers to do for them. They’re a little weak when it comes to getting that alignment and understanding what the influencer wants and how to create value for both themselves and that influencer. Kipp: No. It’s part of the challenge of influencer marketing and micro influencer marketing is that people are like, “Oh, great. I don’t have to do this stuff myself. I’m just gonna get these other people to do this for me.” And they think it can be a shortcut. Quite frankly it’s harder. It takes a longer time. You have dependencies on other people’s schedules, other people shifting priorities. It’s hard to do that. Kipp: I love the future. It’s gonna be awesome. Ian: We’ve seen voice research change the way people that interact with content. Ian: How do you see this as unfolding and what can marketers do to take advantage of it? Kipp: It’s a great question. You know, I think there’s a lot of things that happen in the market right now that I would call kind of precursor actions. Where the technology is there and visible, but it hasn’t evolved to the next step that really makes it open for marketers. So if you think about voice search for example, you know, when I think most people think of voice search… When I think of voice search personally, I have an Amazon Echo at home and I have Siri in my pocket and on my Apple Watch. And so I ask them questions and I dictate through them and I search through stuff, which is really cool. But, there’s really no open APIs for that platform. There’s no ways for me to like incorporate that voice search on to my website, for example. And so if somebody comes to my website on their mobile device, they just can’t like click a quick mic button and do voice searches and input. Because there’s no real good back-end technology and stuff. Like the market hasn’t kind of caught up to that. And you have to keep your eye on technology and as that evolves, new opportunity’s going to come up. I think the trend though, especially with voice search, is that whenever I ask Siri or Alexa or anybody a question, I get one answer back. I don’t get a list of answers back, right? And search is moving from this long-tail model to this kind of fat head, you know, first true answer discovery more similar to a Facebook news feed, or an Instagram news feed, or a Twitter feed, or something like that, right? And, you’re seeing that happen a lot now. And so if you’re a marketer, you have to think about really doubling down on what we’ve always thought about, which is like being the best answer or what we’d often call the canonical answer, like the original source of truth on a topic. Because that’s how you’re going to be that one answer as that market evolves. And that’s something that you can focus and execute and do right now, right? But should pay off long term as we see trends in the industry move that way. Kipp: Took us a decade to get there! Ian: And I think we’re in that in Australia. Ian: Yeah. What does it look like? Kipp: … when it comes to inbound marketing. Ian: And how can we make the world a better place? Kipp: Yeah. So, if you think about this market, right, especially like southeast Asia and Japan, and to some degree Australian and New Zealand, they’ve always been innovators in how you communicate. Mobile technology, messaging, all of these things. And so I think there’s one, there’s a lot of things that the rest of the world can learn from this part of the world. When I think specifically about inbound marketing, and I’ve gotten the chance to talk with tons of marketing professionals from startups, to established brands and companies. And I think that adoption and understanding of inbound techniques is growing pretty rapidly: People here I think come from a channel based mindset. The idea of maybe thinking just solely about email or solely about social versus integrating those for an amplified result. And also approaching those in really a true inbound way where you’re really going to focus on value, not yourself, not your products. And so I think that’s the shift in mindset that folks are going through right now. I see it happening probably a little faster on the startup side of things than I do the established company side. But I think this part of the world is probably, my estimate, somewhere between 12 to 18 months behind kind of the leading edge of adoption around inbound. But I think that everyone here’s gonna make up that time pretty quickly. You know, I’ll probably be back in Sydney in four to six months and I expect to see a lot of change even in that amount of time. Moby: If HubSpot events are anything to go by, like the Grow With HubSpot Sydney, and the HUG. It used to like 200 people. Moby: That grew and now grew into 600, probably so very much more. In a very quick time, the word’s getting out there. Kipp: Yeah. One, it’s a culture that’s super engaged and wants to learn. It cares a lot about doing work better and doing really great marketing, which is fantastic. And two, you know, we’re trying our best to help and educate the market, and spread the word. From whether it’s our free inbound marketing certification, whether it’s our events, whatever to do that. And fortunately, we started the business 10 years ago. We’ve learned a lot of lessons over the last 10 years. So when we’re in a newer market, like we are today here in Australia and across the broader Asia-Pacific region, we can learn from those mistakes. And we can actually help people learn at a much faster rate. So I would expect it to grow and go much faster than it did originally in the U.S.
Ian: Well Kipp, thank you so much for your time. We really do appreciate that you could spend time with us to share some of your knowledge and wisdom. Kipp: It’s an honor to be here. Thanks so much. I’ll take any and all excuses to talk about marketing. It’s great. Moby: Kipp, thank you so much for your time. We really appreciate it and we can’t wait to have you back in Sydney at Inbound 2016 in November. Kipp: Yeah, I hope that lots of folks from Australia will join us at Inbound 2016 in November. Excited to see you there and I’m excited to talk with everybody again when I come back to Sydney.